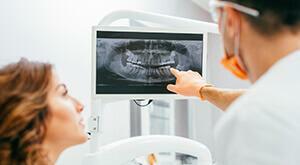 Are you curious about how technology impacts your dental treatments at California Happy Smiles? This may not be the first thing that comes to mind when determining what dental office will meet your family’s oral health needs, but dental technology can improve almost every aspect of the dentistry treatment process. Read on to find out more about our state-of-the-art technologies, and feel free to ask our team all about the latest techniques and technologies available in our Milpitas office. Contact us to schedule an appointment today. Of all the dramatic changes in dental technology within the last several decades, the introduction of intraoral photography in dentistry may be the most impactful for patients. These images give your dentist the ability to show you exactly what we’re talking about, and you get to see your smile from the “dentist’s eye view.” We can easily explore these images together on chairside computer monitors where we can enlarge, color code, and otherwise enhance them, so it’s clear exactly what we’re talking about when we describe oral health concerns and treatment options. We capture intraoral photos using a specialized camera that fits comfortably into the mouth to create clear images of damaged teeth or oral structures to help you better understand your oral health care needs. What intraoral photography has done for the visible portions of the smile, digital x-rays have done for the supportive and interior dental structures. 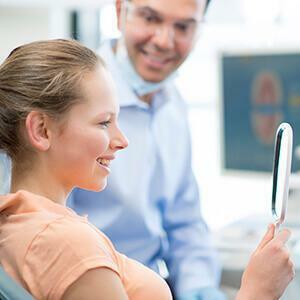 We’re able to quickly capture high-definition images of patients’ smiles that allow us to clearly demonstrate damaged areas and more thoroughly explain potential treatment options. Unlike traditional x-rays that have to be captured then developed using hazardous chemicals, digital x-rays are instantly accessible on our chairside monitors. 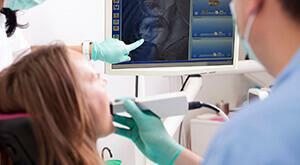 Additionally, they expose patients to significantly less radiation, making them much safer. Best of all, these digital images can be instantly accessed by a dental lab, specialist offices, insurance providers, and others as necessary. This makes effective, consistent care easier than ever. We are also able to view each year’s x-rays in comparison to the previous years to assist in accurate, early diagnosis and treatment planning.